This 1960's Rolls Royce Silver Cloud wedding car is without question one of the finest examples of the Silver Cloud in the area. 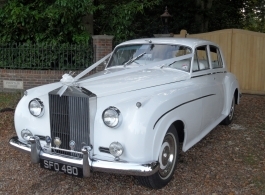 The elegant and stylish look of the classic Rolls Royce Silver Cloud make it the perfect car for brides and grooms alike. Luxurious Ivory /White leather seating, Wilton carpets and burr Walnut picnic tables complete the stunning interior. * There is a fleet of these Rolls Royce Silver Clouds and the one you book may not necessarily be the one(s) pictured. All cars are White or Ivory and the majority have Ivory, White or Cream leather seating.Viweing of the cars can be organised for you.